As a student of the MA New Media my emphasis lies on making the connection between new media and cultural implications. Together with my BA in media management and digital imagineering, and with a profession as web developer, I try to focus on three sides of New Media: the commercial relevance, cultural and critical analysis, and on the actual development and programming of online implementation. Regardless, I am also a sucker for film and series. Visit ghanso.com where you will find my blog. After many years since the original 2D Mandelbrot in 1979, the concept to convert the Mandelbrot to a 3D model was picked up. Earlier attempts failed due to computer hardware not being up for the task and errors were breaking up the formula. Daniel White picked up the 3D project in 2007 and among other mathematicians succeeded in creating the Mandelbulb. 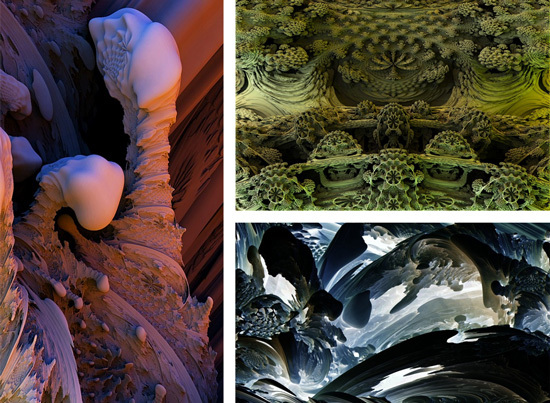 Exploring the Mandelbulb at high zoom in rates with different lighting and color schemes result in incredible images. Also it does have similarities with the original Mandelbrot. The project still isn’t finished as the current 3D does not capture the full potential which an even better formula could present. But to grasp the current state and possibilities of the bulb is presented by the artist in his Q&A. Of course a video based on the Mandelbulb, flying through its infinite potential is also possible. Robert Mallary describes in his Computer Sculpture: Six Levels of Cybernetics (1969) six levels of computer involvement in creating cybernetic sculptures, where the computer is getting more and more autonomous. The Mandelbulb is an interesting example of such a concept. 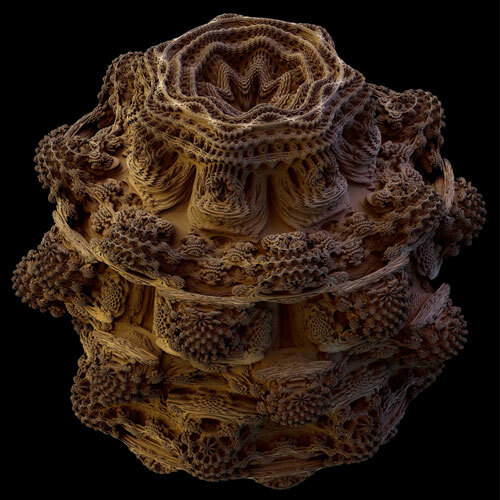 The Mandelbulb, as based on the Mandelbrot, is creating an organic looking sculpture resembling the unlimited enlargement as comparable with that of a solid object and its molecules. The Mandelbulb has a lot of organic looking properties when compared with fractals in nature, especially the romanescu vegetable. The Mandelbulb even surpasses the imagination of the mind, referring to the chaos theory and its unpredictable cascade of detail. I encourage you to view the Mandelbulb website for more in-depth information and astonishing pictures. Mallary, Robert. Computer Sculpture: Six Levels of Cybernetics. 1969. Rpt. In Art and Electronic Media. Ed. Edward Shanken. London: Phaidon, 2009: p. 203-204. « Social Media and Revenues: Where’s the Profit?